Sometimes simple is best. And the Chinese, along with the Vietnamese, Japanese and the Italians seem to have a real penchent for making simple dishes sing. A few ingredients, cooked fast, and served straight away. Ideal food for a light post-work dinner. While eating at Sichuan specialist Chili Cool I’m always blown away by their dry fried beans with pork mince. Similarly, while travelling around Vietnam, simple bowls of stir fried greens were an eye-opener and have left me yearning for them more than any other dish (except maybe those crispy spring rolls). I’ve often been driven to add just a bit of this, a pinch of that to quick cook dishes that started out simple. And just as often I’ve ended up with a clash of textures and flavours. Everything competing for attention, no harmony or focus. Not this time. Not any more. Now I’m going to stick to the plan. The plan in this case being a mish-mash of about four different recipes I found and quite liked the sound of. See, there I go again, fiddling. But with focus. 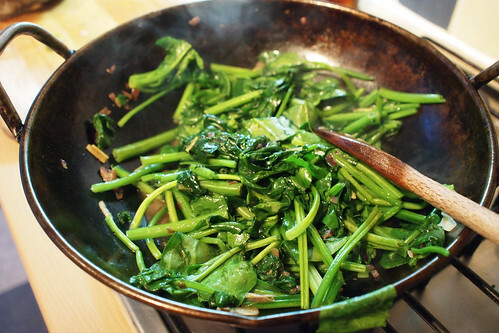 I’ve nabbed the pork seasoning that seems to pop up everywhere in Sichuan cooking, and added it to simply fried Chinese spinach (also called morning glory and water spinach Amaranthus dubius, Red spinach or Hsien tsai) a-la-Vietnam, with ginger, garlic and a red onion (in lieu of spring onions or shallots). The result? Fast, quick and very tasty indeed. 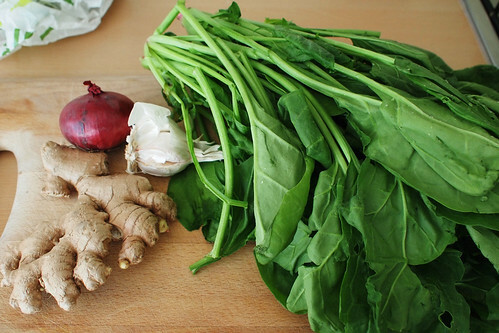 The water spinach is tasty and textures, the pork adding just a little meaty heat to excite the taste buds and build on the aromatic garlic and ginger. This is a straightforward feast for the eyes, the nose and the tongue. And it’s very flexible, cheap and easy. the perfect post work, healthy dinner. You could use pretty much any stir-friable green vegetable here, spinach, bok choi, choi sum, tender stem or purple sprouting broccoli. If it stir-fries, it’ll work. If you’re vegetarian, just omit the pork, or use smoked tofu in it’s place, chopped very fine. Get some rice cooked and leave the the lid on for it to steam. Put some oil in a wok, put it over a high heat until smoking, and at the same time heat up some oil in a small non-stick pan. 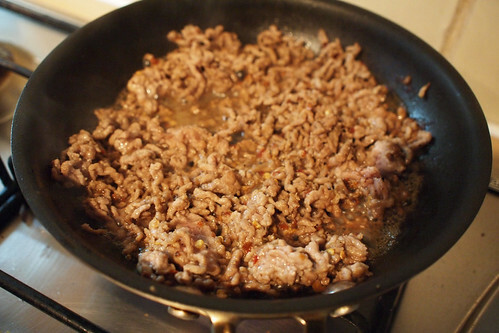 Add the pork to the small pan, and stir it to break it up a little. Add the spice, stir for a few seconds then add a couple of splashes of soy sauce and rice wine. Stir occasionally while you do the spinach. When it’s dry. take it off the heat. Now throw the onion into the wok and stir fry for about a minute, add the garlic and the ginger and stir for about thirty seconds. Then chuck in the spinach. Stir and fry for about three minutes, splashing in a little soy sauce along the way. Serve over the rice, sprinkle over the pork, eat. I got well into having spring greens or cabbage just stir fried, with chill bean paste, garlic, pickled chilli and soy – if you have with a pitta bread instead of rice literally takes five minutes (not sure how authentic but who cares..) Have you got pickled chillis – like https://lh3.googleusercontent.com/-3OvB_KypsNQ/TW1WdZso18I/AAAAAAAAAU8/qp0bqpX63wA/s1600/a.JPG, well nice! I like to add a splash of sesame oil to my stir-fried veg, right at the end, to give it a nice aroma. But otherwise less is more. @Oliver – I love playing around and chopping and changing stuff, that’s the beauty of a simple recipe. I haven’t tried those pickled chillies, although chilli bean paste is a staple. I saw your photo on Flickr and was like, damn, I gotta get me some of that. @Su-Lin – thanks! It’s dead easy to make. So simple yet so tasty. I love the Chinese way with greens; you should get your hands on some white fermented tofu; a cube of that in the stir-fried veg (or even mashed into your rice) is excellent. @Lizzie – You and me both, cooking some unpopular greens (think sprouts and broccoli) Chinese style has converted people from green-hate to green-love. That tofu sounds good, is there any particular brand I should look out for? I’m still a bit of a tofu novice when it comes to cooking. Ooh, like Lizzie, I love a bit of fermented tofu in my stir-fries, though I prefer the red stuff. I don’t think the brand makes a difference when cooking with it. It usually comes in a jar though sometimes in a clay pot and it’s often labelled “preserved bean curd”. Ooh ooh, my kinda comfort food too…Amaranthus is different from amaranth though right? Amaranth is a grain. @Sasa – umm, yes, you’re probably right! Been having all sorts of fun getting the terminology right for this. Whatever it was though, it was pretty tasty. Thanks! i alw get a long face when i see this on the menu- wish it were chicken or beef! grrrrrrr i totally agree with you- the beauty is flash-frying it- in fact last night i had spinach ohitashi at the Japanese restaurant and was thinking- how did they do this? so perfectly cooked-absolute perfection. not too soft, not too crunchy. @Shayma – that fast-fry just transforms the vegetables, and they just soak up any flavours added. Wonderful. I reckon you could substitute some venison mince maybe, or beef even. It would be different, but still tasty.